The RIDGID® micro CA-100 Inspection Camera, the next evolution of the SeeSnake® micro Inspection Camera, allows you to perform more detailed visual inspections in even harder-to-reach areas. Its comfortable pistol-grip design, one-hand controls, and large screen make it easy to see into the tightest spots. The micro CA-100 comes standard with a rugged 0.7" (17 mm) anodized aluminum camera head with four super bright LEDs to see into the darkest areas. Easily rotate the active image counter-clockwise to see in any situation. With an available 6 mm camera accessory, the micro CA-100 Inspection Camera allows you to service and identify problems in more places. 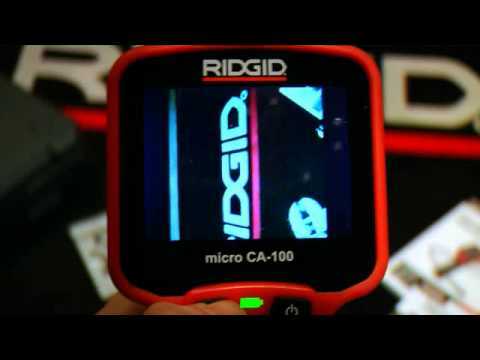 The RIDGID micro CA-100 Inspection Camera provides solutions whenever and wherever you need them. Image Rotation 4 x 90°. Waterproof Camera head and cable to 10' (3 m). Attachments Mirror, hook and magnet, in a blow-molded case. micro CA-100 Inspection Camera is rated 4.7 out of 5 by 22. Rated 5 out of 5 by GaryA from This is a must for every tool box ! !, especially for the price . The color camera is great for working in areas to help distinguish items and wire colors . I also like that it uses two double AA batteries , so you can remove them when not being used . rechargeable tools , Never are charged when you need them !!! :-( I would like to see the Light adjust a little lower before shutting off. I would also like to the Very useful small attachments , ie: mirror , magnet, and hook be painted a blaze orange instead of black, to help locate or not loose them . Rated 3 out of 5 by orobot from Picture freezes Bought this as the liftime warrenty sold it to me. It has a good feel to it, and feels like quality. AS soon as it came i tested it and it seemed fine. I later picked it up again after been stored outside with the spec limits but as soon as you move from a well lit area into a dark area the picture freezes. I have to turn it off then back on. I wasnt sure if the cold batteries were an issue so before i contact warrenty services i will leave it in the house and try again. HOpefully this is a glitch. LIke i said i bought it for the lifetime warrenty so i will see what happens. Tthe case that protects the camera is good. Rated 5 out of 5 by JPL1 from Professional tool I would like to know types of uses with this kind of camera. I will use it in plumber situation but I am sure there is lot more situation we can use this camera. Rated 5 out of 5 by JWALK from Good Balance of Features Was looking for an inspection camera that did not require a charger, had a good display, was easy to use and affordably price. Evaluated several other name brands but most had camera tubes that were difficult to direct. The replaceable batteries provided adequate service life, illumination was very good and the image from the camera was excellent. The rigidity of the camera tube helps keep the camera pointing in the right direction but can make maneuvering a little more difficult. Also purchased a tube extension and the optional smaller camera, but the standard camera does provided a wider field of focus. Rated 4 out of 5 by Laddy from Camera has good features, and good quality picture. After 2 uses, the battery holder crumbled into pieces. Need to replace. Very cheaply made. Rated 5 out of 5 by Ratman from Great product so easy to use I am a pest controller and I have only had my Ridgid camera one week, what an excellent piece of kit, I have used it on numerous occasions in that first week it has saved me a lot of time and effort. I can highly recommend this product. Rated 4 out of 5 by Minator from small product & big help Everything what is visible you will see , but take care of durability of this product, because you will work with water. Rated 5 out of 5 by white93193 from This product is great foe HVAC When I need to check a heat ex changer I use the micro CA-100 Inspection Camera. I even used it when working on the wiring on my service van. I bought the extension, I recommend it. Rated 5 out of 5 by DGlaze5 from Great inspection camera It's a great camera for inspecting the inside of a furnace or air conditioning coil. It auto focuses, being able to rotate the screen, turn light up and down. Only issue is needs longer battery life but not important. Rated 5 out of 5 by edwardp2 from This a tough camera This is a great inspection camera for all needs . We use it for checking inside toilets and for holes we cut to see where leaks are coming from. All around great tough camera. We love them at Convenient Plumbing Inc.. Rated 5 out of 5 by WEHunt from micro CA-100 Inspection camera It is very easy to use and has a good quality camera, the led lighting system is very good too,. The rotate view funtion is very good for awkward areas. The scope flexable arm length is great.